The works of the Rev. Joseph Bellamy, D. D., late of Bethlem, Connecticut. This book, "The works of the Rev. Joseph Bellamy Volume 1", by Joseph Bellamy, is a replication of a book originally published before 1811. It has been restored by human beings, page by page, so that you may enjoy it in a form as close to the original as possible. The Works of the REV. Joseph Bellamy Volume 1 by Joseph Bellamy was published by Book on Demand Ltd. in October 2013. The ISBN for The Works of the REV. Joseph Bellamy Volume 1 is 9785518729056. Be the first to review The Works of the REV. Joseph Bellamy Volume 1! Got a question? No problem! Just click here to ask us about The Works of the REV. 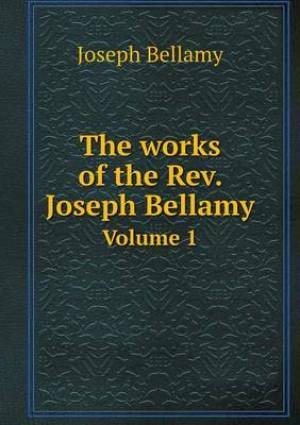 Joseph Bellamy Volume 1.